Family has taken priority this summer, but I've still tried to squeeze in some sewing each day. These blocks took a bit over a week to cut and assemble while I slipped in and out of the studio when I had time. While I might not have gotten to blog as much as I'd liked, process pictures were flying back and forth with close friends to get their thoughts. A few said a Lone Star quilt was a bucket list quilt for them, and wondered which method I used. I thought you'd be interested to know as well. All and none. 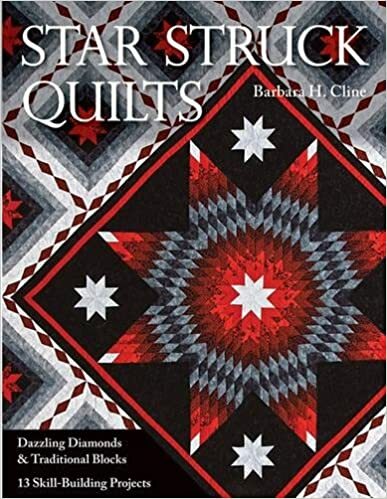 Hints,Tips & Tricks: I recommend finding the new Judy Martin book from which this pattern came, Singular Stars, and another, Star Struck Quilts by Barbara Cline. They are worth the money and time investment, and both were read cover to cover more than once. Each uses slightly different techniques, and I tried them all. Sometime during the first quarter of piecing this quilt, I gave both up, and did it similarly as I did in my post, How to Piece a 6 Pointed Star from Scraps. The Creative Grids ruler above is indispensable, in my opinion. It's over-sized, and almost covers the whole block. The number of grippy spots in just the right place means ease in trimming strips accurately, and is a snap to get the point and initial 45 degree angle. Squaring up the block at the end is a bonus. I anticipated making a Lone Star quilt some months ago, and purchased fabric for the project. I had just purchased a vintage Lone Star quilt full of 1930's and 1940's prints, plaids, and stripes. I was head over heels with the busy look so that's what I bought. Of course, both books warned against any directional fabrics, and even suggested using only fabrics that read as solids, but I threw that to the wind. Do wash your fabric! You don't want uneven shrinking after all this work in piecing! Masking tape: I used it extensively to mark strips, blocks, and added notes that helped me remember the order to sew the blocks. It's amazing how hard it is to remember the order when there are 12 different blocks to deal with. I would forget between the cutting table and sewing machine! I ripped many times before I finally gave in to labeling. I could have saved myself a lot of trouble by starting out this way. You sew and learn. It never seemed to make sense when I looked from across the room, and constantly second guessed the position. I referred to the strip of fabrics on the right while laying the blocks up on the wall. Even with a cheat sheet of sorts, I struggled getting these up in the correct orientation. Can you spy the blocks out of order here? Check out those at 5 and 6 o'clock. It seemed like a crazy pattern to make at the time, but when I laid in the final 3 blocks it all came together. Seeing that spiral was pretty sweet, too. I wasn't sure it was going to happen until I saw it with my own eyes. And my opinion about using fabrics that all read as solids? I'm so glad I did it my way. Oh Julie I love this!! One day I will make a lone star. When I first saw the quilt, I thought you must've quilted it with a spiral. Then I saw the spiral in the piecing! Fantastic! And I really like your choice of fabrics! A lone star is a bucket list for me too. My engineering husband would have a Mind Explosion with this pattern! Any time I do something that isn't evenly balanced and symmetrical, he thinks I've pieced it wrong. The spiral in this has the brain doing a double take, but I like it! Sounds like lots of concentration to get everything in order. Good job! Being a new quilter, I can't imagine stitching this block. I was mesmerized by the spiraling too. A lot of work and the outcome is superb. Very striking. Love the look. You did an excellent job on it. Wow. Yikes, your skill level is a much higher plane than mine. I can't imagine sewing a top like yours. It is amazing and awesome. That is so awesome! I haven't seen a spiraling lone star before, and this one is fascinating to look at. Great job putting this together! I'm glad you did it your way, too. It looks so cool. Oh, my goodness, this is amazing! You really challenge yourself! Masking tape is one of my best friends, too! Happy family time!